Seven-year-old Jacinta, however, was unable to contain her excitement about this first vision, and mentioned it to her mother. Word soon spread through their small rural community. Some immediately accepted the vision as an authentic apparition of the Virgin Mary, but others — including Church officials — were skeptical. Crowds of both believers and curiosity-seekers gathered to watch Lucia and her cousins at the later apparitions (about 50 people came in June; 5,000 in July; 15,000 in August; and 30,000 in September), and at the final one, some 70,000 people witnessed the famous Miracle of the Sun. In the summer of 1929, while residing in a convent in Tuy, Spain, Sr. Lucia had another vision. This time, Our Lady returned as She had promised at Fatima to ask for the consecration of Russia to Her Immaculate Heart. This apparition was followed by a visit two years later, in which Our Lord spoke to and warned Sr. Lucia about the deadly consequences to the Church hierarchy for failing to perform the requested consecration. Sr. Lucia reported these mesages to her confessor, Fr. Bernardo Goncalves, urging him to find some way to persuade the Holy Father to perform the ceremony. Despite the fact that her earlier visions had now been declared “worthy of belief” by the Vatican, no action was taken to comply with Our Lady’s request. By 1935, Sr. Lucia had begun putting her urgings in writing, telling Fr. Goncalves, in reference to his questions, in a handwritten letter that “it would please Our Lord very much” if he insisted to his bishop that the consecration be done. By 1941, at the insistence of her bishop, Sister Lucia wrote her third and fourth memoirs revealing the first two parts of the contents of the Secret delivered on July 13, 1917 by Our Lady of Fatima in Her own words. Only the last part of the Secret, the so-called “Third Secret,” remained undisclosed. A few years later, again at the instigation of her bishop, Sr. Lucia reluctantly wrote the content of the Third Secret on a sheet of paper, sealed it in an envelope, and had it conveyed to Bishop José da Silva of Fatima. By agreement between Sr. Lucia and the bishop, the letter was to be made public at the latest in 1960. Before that date, in 1957, the still-sealed envelope was transferred to the Vatican, where it was deposited in a safe in the papal apartments. Meanwhile, Sr. Lucia kept urging that the requested consecration be done exactly as specified. In 1946, she explained in an interview that the general consecration of the world to the Immaculate Heart performed by Pope Pius XII in 1942 was not satisfactory, because it was not the specific consecration of Russia and all the Catholic bishops did not join the Pope. In 1952, the Pope did mention Russia in another consecration, but failed to perform the ceremony in union with all the bishops of the world. Evidently, Pius XII had not been informed of this requirement, which is explicitly stated in Sr. Lucia’s memoirs. By 1957, Sr. Lucia was clearly dismayed by the Church’s continuing failure to accede to Our Lady’s request. In a meeting with Fr. Agustin Fuentes, Postulator of the Cause for Beatification of Francisco and Jacinta Marto, she emphasized that whole nations risked disappearing from the world and many souls were going to hell as a result of ignoring Our Lady’s request. This interview was published widely in English and Spanish in 1958, with the approbation of the Bishop of Fatima. After the death of Pope Pius XII, in the summer of 1959, an anonymous report was issued from the bishop’s chancery office in Coimbra, where Sr. Lucia’s convent is located. The report denounced Fr. Fuentes’ 1957 interview with Sr. Lucia as fraudulent. To this day, no one has taken responsibility for making this claim. Although Fr. Fuentes would later be completely vindicated, in 1961 this anonymous fraudulent “report” was used as the basis for dismissing Fr. Fuentes as the Postulator of the Cause for Beatification of Francisco and Jacinta Marto. In 1960, the appointed time arrived for the Third Secret to be revealed. To the disappointment of tens of millions, the Vatican withheld it, saying that it would probably “remain forever under absolute seal.” Like the mysterious report issued in Coimbra, this announcement was also anonymous, with no Vatican official taking responsibility. Editors and reporters from Catholic media immediately sought reaction from Sr. Lucia, but this proved futile. They found that Sr. Lucia was strictly forbidden to speak about the Third Secret to anyone, and was allowed no visitors other than close friends and relatives. After 1960, even her longtime confessor (since the 1930’s), Fr. José da Silva Aparicio was not allowed to see her when he returned to Portugal from Brazil — even though in the early 1950’s he was free to do so. Shortly after the conclusion of the Second Vatican Council, Pope Paul VI abrogated Canons 1399 and 2318 of the 1917 Code of Canon Law on November 15, 1966, thereby permitting anyone in the Church to publish on the subject of Marian apparitions without obtaining an official imprimatur. However, Sr. Lucia, alone out of 700 million Catholics worldwide, was denied the benefit of this dispensation. Bound by her vow of obedience as a nun, the one person who actually received the Message of Our Lady of Fatima remained forbidden to speak freely on the subject, without special permission from the Vatican. A year later, Sr. Lucia’s memoirs were published, bringing widespread attention to Our Lady’s request for the consecration of Russia. Thousands of Catholics responded by signing petitions asking the Pope to perform the ceremony. When Pope Paul VI visited Fatima in May of 1967, Sr. Lucia pleaded to speak with him, but was rebuffed and told to “speak to your bishop.” Her bishop, meanwhile, was not able to make any effective effort to achieve either the consecration of Russia or the revelation of the Third Secret. For the next fifteen years, Sr. Lucia remained in cloistered silence while nothing was done to respond to Our Lady’s Message. Finally, in March of 1982, a meeting took place between Sr. Lucia and the Papal Nuncio to Portugal. Sr. Lucia took this opportunity to fully inform the Nuncio of the requirements for a valid consecration of Russia to the Immaculate Heart of Mary. However, in his report to the Pope, the Nuncio knowingly failed to mention that the world’s bishops must join the Pope in performing the ceremony. A few months later, on the eve of a visit to Fatima by Pope John Paul II (May 12, 1982), the Vatican newspaper L’Osservatore Romano published an article by Father Umberto Pasquale, a priest who had corresponded with Sr. Lucia for over 40 years. Fr. Pasquale restated that Sr. Lucia clearly told him that Our Lady of Fatima never asked for the consecration of the world, but only of Russia. He also published a photographic reproduction of a handwritten note to him from Sr. Lucia confirming that the request referred only to Russia, and not the world. On May 12, Sr. Lucia wrote a letter which was made public 18 years later by the Vatican in connection with the alleged revelation of the Third Secret in June of 2000. The Vatican said the letter, dated May 12, 1982, was addressed to the Holy Father, but this cannot be the case, because it refers to the Third Secret as something “you are so anxious to know.” This would make no sense if the recipient were the Pope, since he already knew the contents of the Third Secret at that time. Significantly, the Vatican’s own translations of the original Portuguese into other languages omitted this phrase, indicating that the officials who published these documents knew the letter was not addressed to the Pope, and were trying to hide that fact. The telltale phrase could not be omitted from the handwritten original, because it was published as a photocopy. 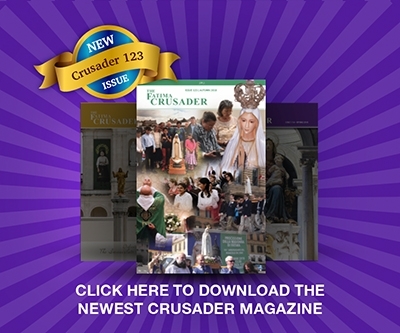 In midsummer of 1982, the American Blue Army’s Soul Magazine published what it claimed was an interview with Sr. Lucia, in which she allegedly stated that the May 12 consecration had satisfied Our Lady’s request. The article did not explain how the request could have been satisfied by a ceremony that neither mentioned Russia nor included the participation of the world’s bishops. In private conversations with friends and relatives, Sr. Lucia repeatedly denied this claim, but explained she could not say this publicly, because she did not have permission to do so from the Vatican. Then, in September of 1985, an account of an interview with her appeared in Sol de Fatima magazine, published by friends of the Spanish Blue Army. It quoted Sr. Lucia affirming once again that yet another consecration of the world, performed in 1984 in Rome, still did not satisfy Our Lady’s request. The text of the consecration made no mention of Russia, and none of the thousands of other bishops of the world were commanded to participate. A year later, one of the few family members permitted to visit Sr. Lucia spoke out. Maria do Fetal, a cousin, publicly stated after a visit that Sr. Lucia had said the consecration still had not been done. Her statement gave a momentary voice to her cloistered cousin, who was still not permitted to speak for herself. In June of 1987, Sr. Lucia made a rare excursion outside her convent to vote in a general election. In a brief exchange with a journalist, Enrico Romero, Sr. Lucia confirmed once again that the consecration of Russia had not been done. When the Pope scheduled a visit to Fatima in May of 1991, Sr. Lucia initially declined to attend, but was ordered to do so. Pope John Paul II granted her a private audience lasting half an hour. Afterwards, neither Sr. Lucia nor the Pope made any comment in support of published claims that the consecration had been done. Their silence on this subject strongly reinforced the conclusion that the Consecration of Russia had not yet been done. In the autumn of 1992, Sr. Lucia was allegedly interviewed by Father Francesco Pacheco, Cardinal Antony Padiyara and Bishop Francis Michaelappa. The clerics’ chauffeur, Carlos Evaristo, later published an account of the interview, which included the usual claims that the consecration had been done. One of the clerics, Fr. Pacheco, later published a repudiation of this report, calling the credibility of Mr. Evaristo, the chauffeur and self-confessed “conceptual translator”, and his report of this interview into question. First, she has been urging, ever since the early 1930s, that Russia be consecrated to the Immaculate Heart of Mary by the Pope in union with all the bishops of the world, as Our Lady of Fatima requested. Second, she has repeatedly explained that various consecrations over the past half-century have all failed to meet the specific requirements of Our Lady’s request. She has never openly and unambiguously said otherwise. Third, she fully expected the single-page text of the Third Secret to be revealed in 1960, and still wants it revealed. This is not the four-page document made public by the Vatican in 2000, at an event from which Sr. Lucia was notably excluded. Despite claims of Archbishop Bertone in November of 2001, Sr. Lucia herself has given no direct indication of any kind that she agrees with the claims made by the Vatican in its “Third Secret” announcement. Fourth, and finally, she is in her late 90’s, and will not be with us for much longer. Hence, if she is not allowed to speak freely soon, she will take the rest of what she knows about the Message of Fatima to her grave. The world’s last direct link with a message from Heaven will be gone, perhaps leaving some questions forever unanswerable. This would appear to be what Fatima revisionists in the Vatican intend. The focal point for the aspects to the Fatima story is, of course, Sr. Lucia. She saw the visions, she received the Message, and she wrote down the words spoken by the Blessed Virgin. She knows the whole truth about the Message of Fatima. And yet, Church officials have treated her in a manner that seems more appropriate to someone spreading heresy than someone bearing a message from the Mother of God.